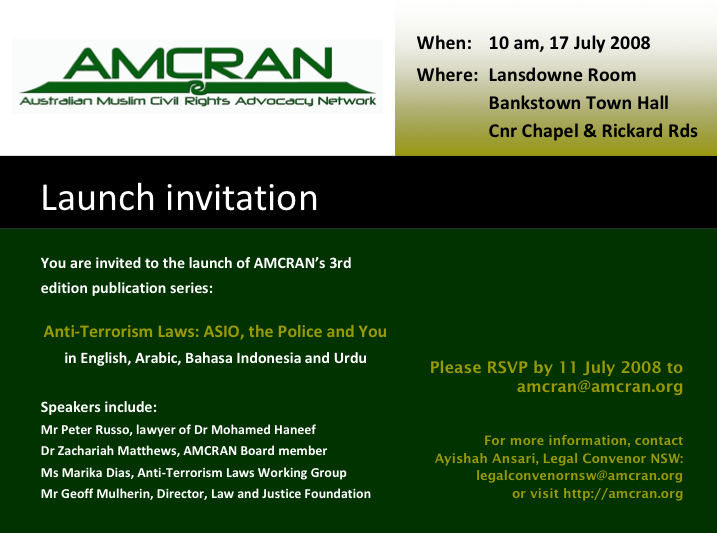 The long-awaited third edition of the publication series Anti-Terrorism Laws: ASIO, the Police and You in community languages will be launched on 17 July 2008 at 10 am by Dr Haneef's lawyer Mr Peter Russo. This series of publications is designed to educate the community on their rights and responsibilities under Australia's counter-terrorism laws. It is presented in four languages: English, Arabic, Bahasa Indonesia, and Urdu. The third edition covers new areas of law introduced since the first edition in 2004, including the association offence, sedition, preventative detention and control orders. This publication is essential reading, and provides a concise, simple, yet thorough coverage of the laws that all Australians should be aware of and understand. Ms Marika Dias, Solicitor, Convenor of Anti-Terrorism Laws Working Group, Federation of Community Legal Centres (Vic) Inc. The booklets will be distributed at no cost at the launch, or you are welcome to place an order for the booklets to be posted to you by completing the Order Form. The booklet are also available to download from this website in all four languages after the launch.